Buy Meera Herbal Hair Wash Powder Shikakai,Tulsi, Vetiver ensures Healthy, Strong, Beautiful Hair. Shikakai, Green Gram, Tulsi, Vettiver and Reetha for clean & healthy hair. Rediscover traditional hair care in a whole new form, with Meera Herbal Hairwash Powder. An aromatic blend of herbs and roots that strengthen and nourish your hair, and flowers and herbs that soften and condition it as well. 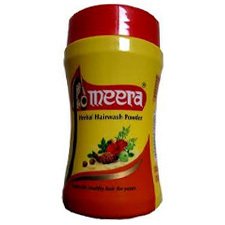 Meera Herbal Hairwash Powder restores the belief that using the goodness that traditional herbs and flowers offer as a means of haircare ensures healthy, strong and beautiful hair. Meera Herbal Hairwash Powder has also revived the time honoured traditional practice of taking an oil bath, once every week. Make a paste with water in the bowl and apply on wet hair. Rinse thoroughly and repeat if necessary. Shikakai, green gram, tulsi, vettiver, Eucalyptus globulus, Vigna radiata, Hibiscus rosa-sinensis, Madhuca longifolia, Cinnamomum tamala, Cyperus rotundus, Lippia nodiflora, Acacia concinna, Ocimum sanctum, Hedychium spicatum, Albizia amara, Vetiveria zizanioides, Trigonella foenum-graecum and Sapindus trifoliatu.